**Note: the measurements given below are for 1:24 scale. If you would like to make the chest in 1:12, double the measurements (including the wood thicknesses). 1. Cut two small pieces of 1 mm wood for the base of the dressing mirror. These two pieces should be rectangle in shape and measure 19mm x 24mm. These will form the base of the mirror. For the 20mm high posts which support the mirror, cut two lengths of 2mm thick wood. You will be carving these lengths, so make them longer than you need for ease. 2. As you can see from image above right, make one of the base pieces small on three sides (the two shortest sides and one of the long sides) by approximately 1mm. This means you will have one piece measuring 19mm x 24mm, and one piece measuring 18mm x 22mm. 3. Sand the three edges of both pieces to create a nice chamfer or bevel. Once they are sanded as you can see in the image above right, glue them together with PVA wood glue. HINT: be careful not to use too much glue, as the water content will warp the delicate wood! 4. You must now carve the design you prefer onto the posts. You can do this as I did with a blade, or if you like with sand paper or a miniature lathe if you have one. Be sure to leave a 2mm un-carved section at 13mm (for the pins of the mirror joint). Once you have carved the same design on both posts, cut them to 20mm. 5. Next, cut a piece of plastic mirror board to 20mm x 13mm. 6. You must now make the frame for the mirror. The mirror piece should be 1mm thick, so you will have to cut small slithers of wood which are more than 1mm in width so that the sit above the mirror. They should be no more than 1mm deep however, or they will look chuncky and wrong. Glue the frame on using a tiny amount of PVA wood glue. Be sure to mitre the edges for a clean finish. 7. Now you must attach the mirror to the posts so that it can swing like a real dressing mirror. To do this you will have to make small holes in both of the posts at 13mm with a sharp fine sewing needle. Using the super glue, glue one end of the jewelers wire into the small pin hole. Once this is done, trim the wire to 2mm in length. Do this for both posts. 8. Lay the mirror next to the posts (above right) and determine where the wire will pin into the frame. Then repeat the pin hole in both sides of the frame. Pin both pieces of wire from the posts into the frame. Do NOT glue the pin in the frame. It must be able to swivel freely. 9. Glue the base of both posts onto the base at a distance of 3mm from the back side of the base. 10. Leave the dressing mirror for an hour to allow the PVA wood glue to set hard. Now you are finished! **Note: the measurements given below are for 1:24 scale. 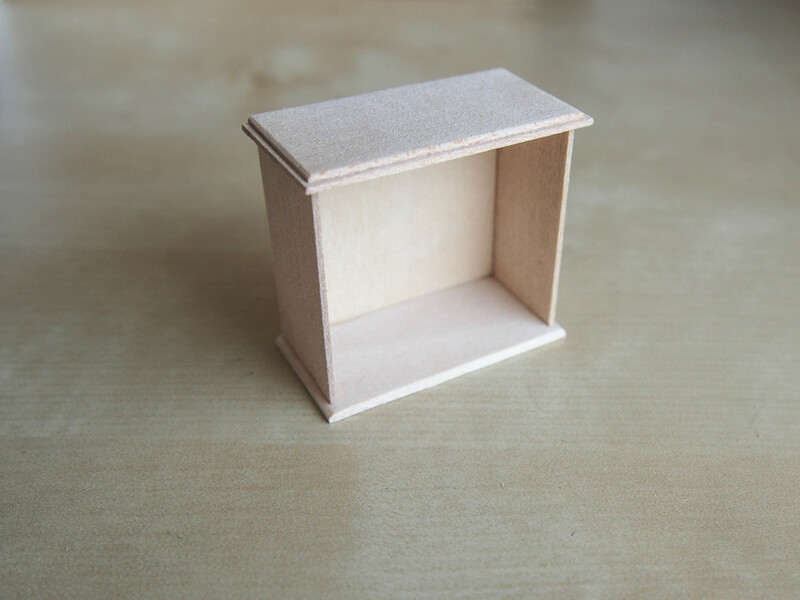 If you would like to make the chest in 1:12, double the measurements (including wood thicknesses). 1 x back panel from 2mm thick wood: 38mm x 34mm. 2. To make the top, you must repeat the same chamfer process which you did for step 2 & 3 of the dressing mirror. This will create a beveled top. 3. Next, glue the pieces together. Allow the two side pieces to sit on the outside of the back panel. Allow the base and top panels the protrude forward - making the panels flush at the rear (as per above right). 4. Glue four feet on the base (above left). These can be any share you choose, including a plain square shape. I chose to use a section of turned wood. 5. You are now going to create four false drawers. At this scale, false drawers look most realistic. If you are working in 1:12 you might want to create real drawers. Create the front panel of the drawers by cutting a panel to the correct size of the opening. Then cut this panel down into four draws. Then cut small strips of wood to form the seperations between the drawers. Glue them together (as above middle). Once glued, trim them down to fit the front of the chest. 6. Before inserting the drawer panel, place in four internal stopping pieces (as above right). This will prevent the panel from falling into the chest and make it more sturdy. 7. Once glued, attach small wooden or brass round draw handle knobs, and you're finished!